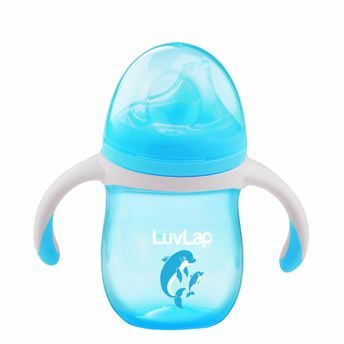 Get your baby cup-trained with Luvlap Dolphin Sipper! This cute dolphin-designed sipper with detachable anti-slip handles is ideal for your 6 months plus baby. The soft silicone spout helps in the overall oral development of your child and makes your child independent at least when it comes to drinking. It has an in-built valve which makes it non-spill and leak proof preventing any unwanted spilling and mess. The detachable anti-slip handles make it easy for the baby to hold the cup. All the parts are sterilizable and hence, is extremely safe for your baby. Explore the entire range of Feeding and Nursing available on Nykaa. Shop more LuvLap products here.You can browse through the complete world of LuvLap Feeding and Nursing .Alternatively, you can also find many more products from the LuvLap Dolphin Sipper Blue range.